Nothing in life prepares you for losing the woman who has instilled you with love, self-confidence, courage, forgiveness and strength. My mother gave me the tools to understand and interpret the world around me. She helped make my world a beautiful place. On the 23rd of May 2016, my mother was diagnosed with stage 4 advanced lung cancer. There’s no coming back from that. But as shocking as that news was to me (and my family) my mother never let that break her spirit. She showed courage and strength. Every. Single. Day. 10 short weeks later, she was gone. I could go on and on about the depression, darkness and horror that consumed me for weeks and months afterwards. But instead, I’ll focus on the words my mother lived by. Words that I’ve grown up with since I was a child. These words have always inspired me. And this time, they’ve inspired me to push past the most difficult challenge I’ve ever faced and in the process, hopefully I’ll help others do the same. It was an idea born from the deepest recesses of my mind. Born from countless hours of looking at emails, messages, photos and videos and wishing things could be different. Born from hours of learning (and still learning) how to deal with the loss of my dear mother. As a web developer by trade, I’ve built hundreds of complex applications. Some have made me want to pull my hair out and others have made me want to fall asleep, but this was a challenge I’ve never faced before. 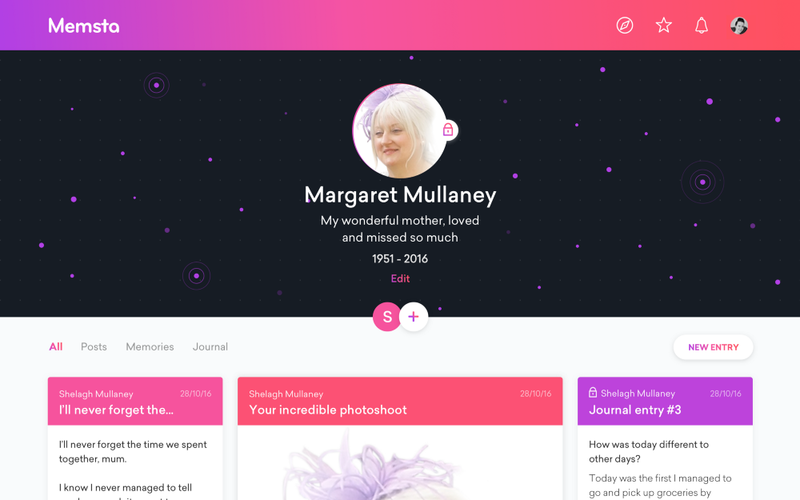 How do I design something that will help me deal with the loss of my wonderful mother? Unlike most websites and experiences, I started with a story. Not a user story, but a comforting story told to children. When a loved one passes on, they become a star. Now, we all know the world is a little more complicated than that, but this story gave me comfort. It made it easier for me to sleep at night and it made it easier for me to rationalise this horrible and scary experience. And with that, the first ever mock-up for Memsta was born. We started by crafting what a star would look like in the Memsta universe. An unconventional, unique and completely backwards way of starting any project, but one that made total sense once it was created. We started by creating a place for me to keep photos, memories and journal entries to deal with the grief and loss I was going through. From here, Memsta started to expand and turn into a real, living and growing project. I sank all of my free-time, energy and resources into getting things done and making progress. To start with, there were no user-flows or wireframes. Instead, it was an organic and iterative extension of the thoughts and feelings that were growing and evolving inside of me. As we dug deeper and deeper, we created and discovered more questions. How would stars be added to the universe? How would we edit stars? How would profiles look like? Will the platform have friends? Will we allow people to comment on stars? Can people search the Memsta universe? Will stars be public, private or both? As questions kept on coming, we kept on iterating. But then, reality hit home. 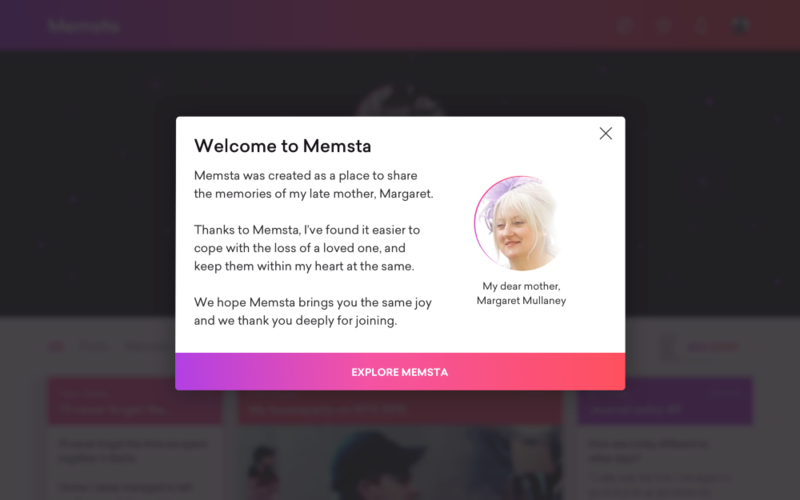 For me, it was important to launch Memsta on the anniversary of my mother’s passing…and there was a lot to do. We needed to keep things lean, and we needed to start thinking as if Memsta was an MVP. With my day job, I only had a limited amount of time to work on Memsta each day. I still had mouths to feed and bills to pay, so we planned. 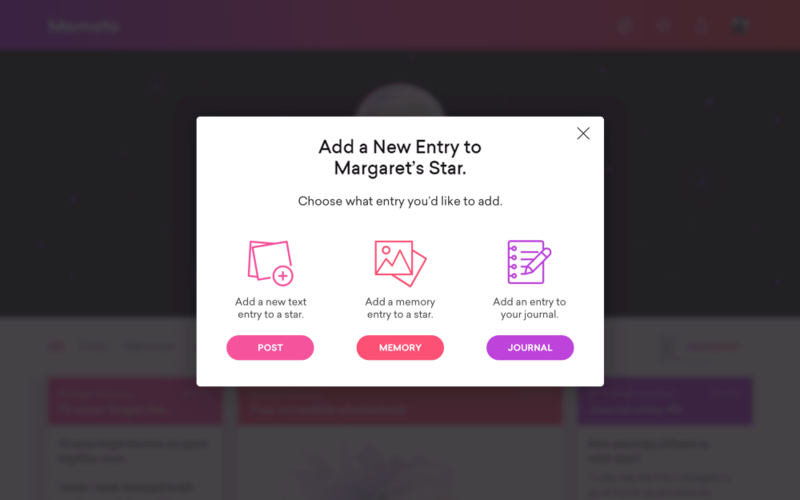 We listed, cut and condensed all the core features needed to create an MVP that we could launch on my mother’s anniversary. And even then, we had to work HARD to get things ready. Some will be new and others you’ll have heard time and time again, but there are some key lessons from this experience that are worth sharing. Memsta was not something that I could’ve ever seen myself creating in any lifetime or timeline. Some people will never understand how much this idea means to me or why it exists, but it meant enough to me that no matter what, I had to build it. Memsta started as a product for me and only me. It was only after it started helping and making the healing process easier for myself, that I believed it could help others. Scratching your own itch is absolutely fine, you have needs too, not everything needs to be built for someone else. In this day and age, it’s possible to design and build anything. With a little hard work and plenty of optimism you change the lives of thousands in seconds. How you do that, is up to you. Dream your dreams and then start to wonder how to make them a reality. If you have a vision, then allow yourself to see what it looks like and then create the steps that’ll get you there. Memsta is a team effort and it’s something that couldn’t have been done alone. I have countless people to thank for all the help and support they’ve given me, but I wouldn’t have got that help without asking. Memsta is rough. There are bugs and it needs plenty of polishing, but that being said, it’s good enough for now and over time it’ll become even more incredible and will continue to grow into something to help more people. Design is never done, always be ready to tweak, change and update something to make it even more wonderful. If you’re always ready to bend and adapt, then you’ll make leaps and bounds in anything you do. To the wonderful kind, caring and loving woman who always put others before herself. You inspired me to build Memsta and to share it with the world. If a simple app can make a world of difference to me, then I’m sure it’ll do the same for others around the world. Now, I can’t promise Memsta will heal your pain. In fact, I don’t believe the pain from losing someone you love so dearly can ever be completely healed. But what I do believe, is that using Memsta might make the journey a little easier. My mother did so much good throughout her lifetime, that she deserves to be remembered. If you feel that way about someone you’ve lost, then Memsta might help you too.